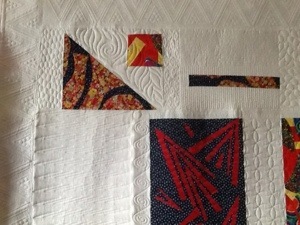 Well, I decided that this “old, grayed quilter” would see if it was possible to make a modern quilt. 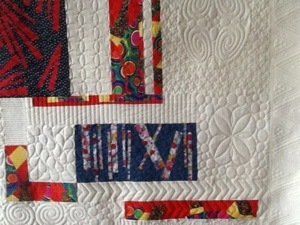 Guess what, I made my first modern quilt and liked it, even had fun doing it. 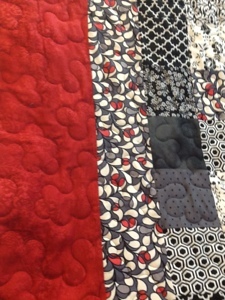 All quilted now and ready for binding…ugh! 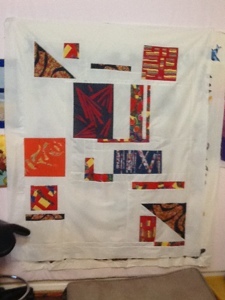 This started with several groupings of pieces of fabric exemplifying a study of space. 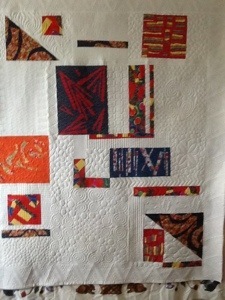 Then I decided that even though I had just used old stash without much consideration of color, I didn’t want to waste my efforts. So..here it is. It does look better in person but hopefully it will pass the “modern” movements inspection. Either way, I called it ugly when I started and have grown kind of fond of it now. Wow, check this out! 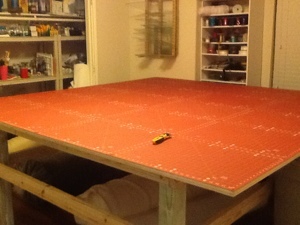 I finally managed to get mats for my gigantic cutting table made for me for Christmas by my son-in-law Kyle. It’s huge, 8 foot square. 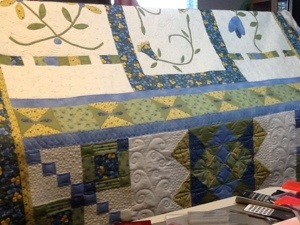 Yes, you are right, I can’t reach the center but it works perfectly for blocking large quilts. I found mats by Sullivan that can be snapped together for a perfect fit. They are nice and thick and well marked. I think I will love them. Best thing is they are totally reversible with a different color on the reverse side. 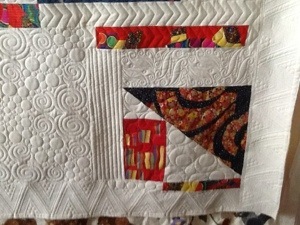 Since I tend to cut pretty much on the same area of my table I will be able to move really used sections to another area or just replace one section at a time. Much cheaper than replacing the entire large mat! Excited! Texas is definitely Red and orange! 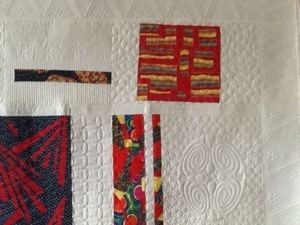 It’s July, it’s HOT, it’s red, orange and all shades thereof! Been reading a lot about color lately. I know I learned some of this in my “very younger” years but my senior moments are more like hours and days now. 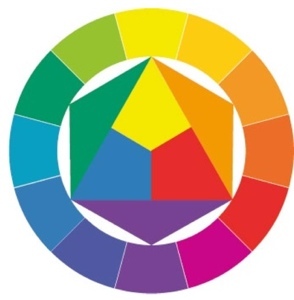 There are some really terrific color wheels out now but the simplest was from a painter, Johannes Iffel of Germany, living in the early 1900’s. it’s so simple that it even resonates with me. Apparently he was the first to assign “feelings” to colors. Interesting trivia!
. 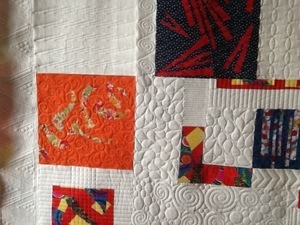 The colors in the center are the PRIMARY colors. They are clear and true and can not be mixed from any other colors. 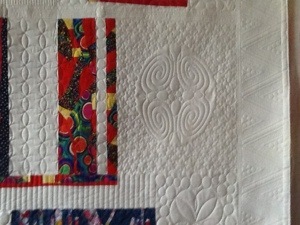 The colors surrounding the center are Secondary colors, mixed from combing two of the primary colors. (Yellow plus blue equals green). The colors on the outside ring illustrate “hyphenated” colors (yellow-green) or, more scientifically Tertiary colors in between the primary and secondary colors Ok…got that! Back to reading and learning about color. 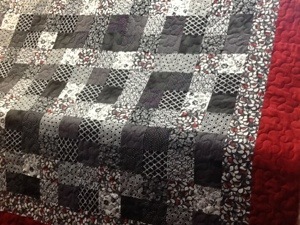 Just finished a neat, fun quilt with some freehand playing. 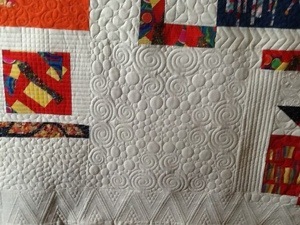 Quilt belongs to Debbie and I think she will like it. It was very Spring/Summery and I wanted it to be light hearted! I like the casual outcome!